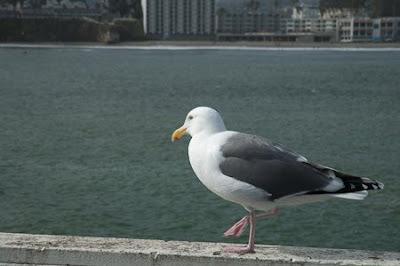 A Photographic Journey...: How about a short visit to Santa Cruz??? 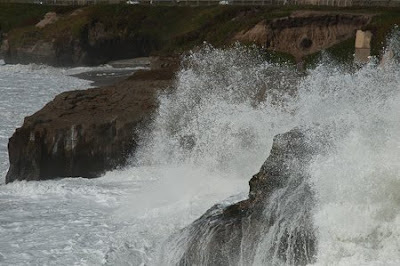 How about a short visit to Santa Cruz??? Sooooo....the question of the day was..."What's the difference between a pier and a wharf????" 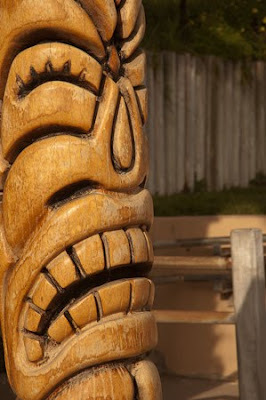 Clueless about the tiki...ain't love grand?!!!! 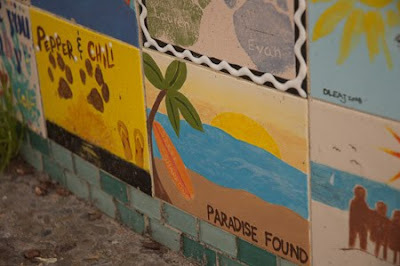 Our friend's tile on the Capitola Sea Wall of Tile, a community art project in 2008. 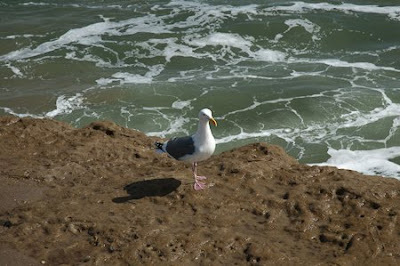 Santa Cruz is a delightful place...and a surfer's heaven on earth!!! 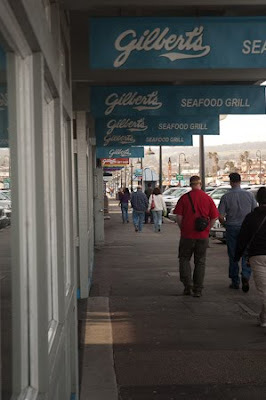 If you happen to stop by...be sure and check out Zelda's in Capitola for an awesome breakfast...and Paradise Cafe, also in Capitola, for drinks and some fabulous Calamari...both spots on the ocean with an awesome view and great people!!! And don't forget to walk the length of the tiled sea wall to injoy the tiles and see the tiki!!! 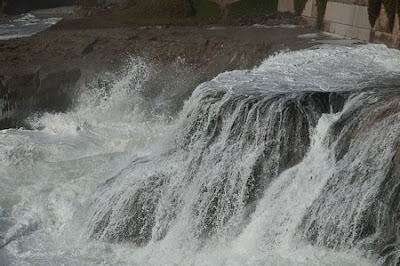 I love the photos of the crashing waves! 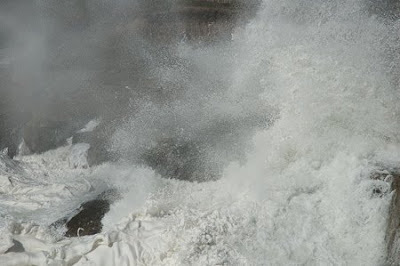 I can feel the spray, the tangy salt smell in the air, and feel the thunder as they crash against the rocks! 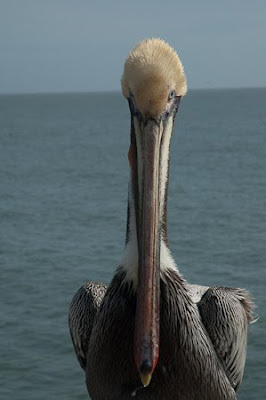 Plus that pelican got character. Great shots and thanks for sharing! Ahhh , another mini vacation thanks to you! Wonderful images. Welcome Prairie Girl!!! Glad you enjoyed the spray and the sea air!!! It was a tad bit warmer than your Scotland seas!!! Thanks V!!! You can come along on anytime!!!! the stormy sea is just gorgeous! 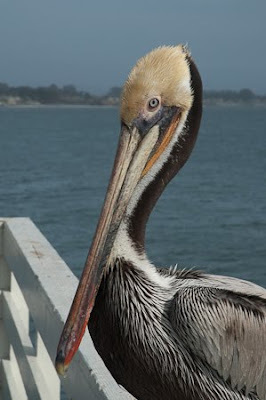 I'm sorry to hear about the pelicans, such comical, friendly little fellers -- so graceful in flight. I love that beach community! And, when the sun is out & the skies are blue it's heaven!! Never fear AH...I have a feeling those pesky ol' pelicans will do just fine now that the weather has cleared up and is turning into spring!!! Yep Cafe...that's where our friend does most of his surfing and coffee contemplation time!!! And it was pretty magnificent with clouds and rolling surf!!! so did you hang ten? 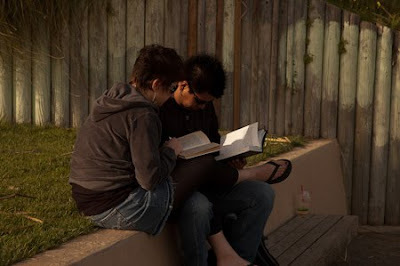 Oh, I miss Santa Cruz. I used to visit regularly. Those stormy surf shots are remarkable! Thanks for the shout out, girlfriend! 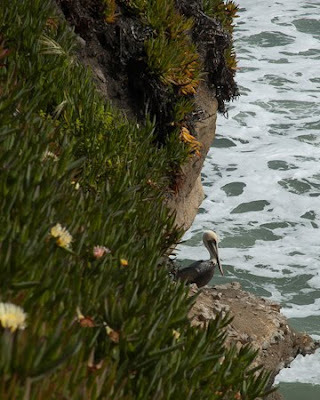 The surf shots are wonderful but my fave is the pelican on the ledge, looking bashful - superb photo. Very nice close-ups of the interesting creature. I got a great shot of three of them flying close to the bluffs on Saturday. I've been there only once 20+ years ago, but did enjoy it. Thanks for the grand tour! You're right PA, but I have to say, the tile display at Capitola is quite extensive and fun!!! It really gives the area a great feeling of community! Great ocean shots. And how did you get those birdies to pose for you? I love the California coast (well, the part without condos). Thanks for the little vacation.